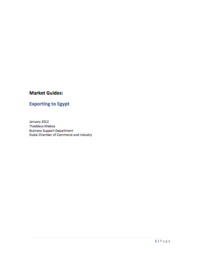 This guide has been prepared to assist Dubai-based businesses looking to export to Egypt. It contains information relevant to exporters about Egypt including: tariffs and trade agreements, certification, labeling and other documentation requirements, quality standards required of goods entering the country and specific export opportunities. Links and sources are provided for readers who require more detailed information on topics covered. Given the change in government experienced in 2011 and expected handover to a civilian administration in 2012, several trade provisions may be subject to change and monitoring political developments is strongly advised. Egypt’s large size and market complexity raises the necessity to secure a local partner with detailed knowledge regarding the market structure and major players. Moreover, prices of commodities in the local market are subject to change, and may differ substantially from levels elsewhere in the world. Keeping abreast of local policy and market-impacting changes is of paramount importance to exporters. All whitepapers are available to you and free of charge. This whitepapers is provided by Dubai Chamber of Commerce and Industry.